Full day guided excursion to the famous Archeological excavations of Pompeii and Oplontis, destroyed in the A. D. 79 eruption of Mount Vesuvius. Pompeii holds an intense fascination for visitors today. 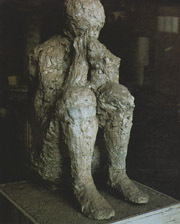 Following the eruption of the Volcano Vesuvius in the year 79 A.D., Pompei lay buried and forgotten for hundreds of years. The town is high on the list of Wonders of the World and the excavations begun in the 18th century are still being carried out today. Our guide will take you slowly some of the ancient streets of Pompeii where you can see Baths, the Forum and houses built the prosperous Romans. Among the structures uncovered was The Forum of Pompeii, a group of temples, courts, and palaces that served as the city’s legislative center. Even if your interests do not lie in history, this is an archelogical site that you cannot be failed to be impressed by. Oplontis is not far from Pompeii, about three miles, and corresponds to the present day town of Torre Annunziata. 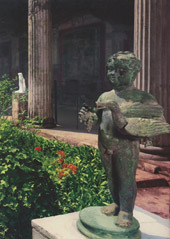 Systematic excavations at Oplontis between 1964 and 1984 unearthed several important villas, most notably “Villa B”, a house that is now known to be the Villa of Lucius Crassius Tertius. Inside the Villa, excavators found piles of jars called amphorae, which were known to hold goods such as wine, oil, and other agricultural products. Because of the presence of the amphorae, the building was thought to be a sort of business center where these goods were manufactured, processed, and sold. These finds, together with some public baths that were excavated there in 1834, help identify Oplontis as a middle-sized town. Though it was peripheral to Pompeii and under its administrative control, Oplontis had sufficient infrastructure to suggest that it was a well-developed residential centre. THIS IS A PRIVATE SHORE EXCURSION WITH PRICES BASED ON THE NUMBER OF PEOPLE TRAVELLING IN YOUR PARTY! Pompeii.org.uk offers a rental service of audio receivers kit, ideal system for visiting the ruins of Pompeii. The communication will be clear in any weather condition and this system will help tourist guides in their job. The tourist guide will be endowed with a transmitting radio with relative accessories (microphone and lace). Every component of the group can use a receiver with its accessories (disposable earpiece and lace). A qualified personnel will offer a continuous technical support to face any further demand of the guide or of a component of the group. The cost for this service is of 2 EUROS per person.